Yep good gen about the trim. And a big difference which 'Gums' would know well from his combat experience (me only every now and then [but not combat I must stress - only our Iroquois pilots went to Vietnam with the US Army]) was having real heavyweight bombs instead of powderpuff lightweight practice bombs for the performance hit. I can only attest to the A4G. We started out also using 45 degree dive angle (as well as 30 degree and gasp 10 degree) slick bombing. A realistic weather cloud coverage height appraisal eventually took away the 45 degree angle but even 'zooming' up to dive entry altitude from high speed approach with a load of big bombs was a struggle usually with full power downhill from a sometimes slower than required dive entry airspeed. Talk about having your hair on fire dealing with all the variables. And of course no one was shooting at me however I could possibly imagine that once committed to the target a 'tunnel vision' takes over much like a carrier approach to a barrel rolling small deck. SALUTE BACK to 'Gums'. So, with all of that, I’m kind of stunned that anyone managed to hit anything. Sometimes with practice from day in day out as on OFS it was possible to hit the target with a practice bomb usually when NIL wind near the coast. Our armament range was on the coast not far from NAS Nowra. However if errors introduced at release point accumulating during the dive (more low angle the more accuracy of briefed sight picture mattered at release) the practice bomb could go way off but usually less that 200 feet. Sometimes it might be so far off target that the range team do not sight the smoke. As 'Gums' will attest 'bombing day in and day out' really helps to hone ones skills. Depending on the actual dumb weapon used the blast/shrapnel radius was important not only for target destruction or damage but also to pull out of the dive safely before encountering those effects (especially if several aircraft bombing together in trail formation). Now one knows why ALPHA strikes were important: Max dumb bombs within a CEP to ensure target destruction so that a RESTRIKE is not required. There were many restrikes which then become more difficult depending on target - so Bomb Damage Assessment is important with the poor old camera plane going low & fast later. Well, Count..... and others. Hope you are all enjoying the tutorial. It is relevant because the Hawg dropped and shot that way for 20 years after entering service. USAF had sold it to Congress with the claim that if you dropped or shot close enough, you didn't need no steeenkeeeng computers. And all the Hawg drivers could easily navigate by dead reackoning and holding their wet finger up to determine wind. Hell, even the A-37 had a low freq ADF besides TACAN. USAF had to keep a straight face, as it could have easily paid a little extra to have a basic A-7D system right outta the box. Face it, the SLUF was gold-plated what with super duper projected map, cosmic radar that had both terrain follwing and terrain avaoidance, a new INS that the F-4 guys were jealous of and then the extra doppler nav system. A basic system for the Hawg would have been an INS, radar altimiter and nav/weapon delivery computer, as the Hawg already had a HUD. In "then year" $$$, that would have been well under $1 million, but that wasn't the point. The point would have been an embarrassed bunch of USAF generals and others. And the Count is right. It's hard to imagine us hitting anything!! The "manual" method, or as we called it "TLBR" (That Looks 'bout Right) required hitting a specific dive angle, airspeed and altitude with the pipper at the correct aimpoint all at the same time. Rottsa ruck. So we learned to "adjust". Fast? release early, shallow? late, and so forth. But we got good. Real good. The Combat Dragon test phase was 6 months and we were rated at 20 meters by the FAC's. This went down to 15 meters as folks got better and we got used to the jet and flew a few hundred missions ( most guys got 400 + in their one year tour). Spaz also brings out a problem with the low angle stuff. No biggie with nape or RX, but many of us picked up frags or even mud from the guy in front, heh heh. Worst thing was a bad fuze that armed below the set safe altitude and you dropped low! You could blow yourself up. Finally, Spaz. I am sure that an Aussie Canberra outfit operated in IV Corps during my ;67 to '68 tour. Then we had Sidewinder FAC's up near us at Bien Hoa. Yep, it was the No 2 Squadron. Flew from Phan Rang with USAF B-57's. The first low level day missions started in September 1967, with forward air controllers marking the targets with smoke. Most sorties were in support of the Australian Task Force in the IV Corps area. Flying at about 3000 feet (915 metres) above ground level (AGL) to avoid ground fire, the crews achieved accuracies of about 45 metres. On a number of occasions, aircraft released their bombs from as low as 800 ft (245 metres), followed by a rapid pull-up to a height outside the fragmentation envelope. However, a number of aircraft were damaged by bomb fragments (shrapnel) and some navigators suffered minor injuries as a result. Yes there were RAAF Canberra bombers in Vietnam. One of my flying course mates was killed along with navigator one night from a cause unknown - remains found and repatriated only a few years ago now. Flying Officer Mike Herbert RIP. Our navigation instructor during ground school at Point Cook went on to eject from a Canberra to survive over Vietnam. Norden? Don't think so but not easy to confirm. RAAF Canberra Bombers were early models without fancy radar sights. "...my job was to maintain the serviceability and the accuracy of the T-4 bomb sites [SIGHTS] to support the Canberra bombing and training programs...."
"No 2 Squadron, Royal Australian Air Force, deployed from Butterworth, Malaysia to Phan Rang air base, 35 kilometres south of Cam Ranh Bay, a large USAF base in the far east of South Vietnam, on 19 April 1967. 2 Squadron ‘Magpies’ were part of the 35th Tactical Fighter Wing and were tasked by HQ 7th Air Force in Saigon, for eight sorties per day for seven days a week, in all areas of South Vietnam from 23 April 1967 until return to Australia in 1971. The Americans referred to the Canberra bombers as B57’s. The Canberra filled a gap in the USAF inventory as it was the only tactical aircraft in South Vietnam which bombed, visually, from straight and level flight, albeit at 350knots. Often, the Canberra could fly below the cloud while the dive attack aircraft could not see the ground to acquire the target because of the low cloud base...."
"...The Canberra had two crew under a fighter-style canopy, but delays of the intended automatic radar bombsight resulted in the addition of a bomb aimer’s position in the nose...."
"...Having gone through the whole process of preparing for our bombing sortie, I wasn’t pleased to contemplate the fact that we may have to abort the mission and land with a full set of six 750lb live bombs on board. So I looked up my bombing tables to see if I could extrapolate (i.e. “guess”) a suitable bombing angle for what I knew would be a much lower air speed than the normal 270 knots indicated air speed that we were used to. I knew that, even if we were to contemplate disgorging our bomb-load, then in order not to damage our suspended undercarriage, and open bomb-bay doors, we would have to fly at 150 knots or less. My bombing tables didn’t go that far down, but I was able to make what I believed was a reasonable estimate of the correct bomb-sight angle setting for flying at such a low air speed...."
I'll bite. Give me the URL that says a 'Norden Bombsight' was in RAAF Canberra bombers please. Thanks. Roger that, Spaz! Looks to me that the Canberra's were equipped with a late version of the WW2 "stabilized" sights, but certainly not the Nord. Of all deliveries, the level release was the least accurate unless you dropped from 100 -200 feet or so and practiced a lot - think a nape delivery or linear CBU. The "trail" distance was not a biggie unless you were way up like the real big buffs. But the range at release, even for the Magpies, was a serious problem if your altitude was just a little off. The Sluf and Viper did really well because we had the radar altimiter and "system altitude" ( INS plus barometric algorithm). In CCIP we had the radar looking thru the pipper, so both range and altitude were compensated for. Typical radar bomb hits from 1,000 or 1,500 feet were less than 50 meters. Visual with CCIP were down there in the 20 meter vicinity. Six page PDF about USAF B-57s in Vietnam at Phan Rang from COMBAT Aircraft January 2019 titled 'Canberras in Contact'. Patch: "A rare patch — the only way aircrew could earn one was to fly at least one night mission over North Vietnam. via Warren Thompson"
To get back on the HAWG A-10 attached from COMBAT Aircraft Jan 2019 6 page PDF 'HAWGS of WAR' at HAWGsmoke 2018.
spazsinbad wrote: I'll bite. Give me the URL that says a 'Norden Bombsight' was in RAAF Canberra bombers please. Thanks. Can't give you a link, but I'm pretty sure they had the old (pick a manufacturer/shop, ie. Aron Meter et al, for US, Sperry-AC Spark Plug) stabilized Mark XIV T-2 as Gums mentioned, until they got the production delayed radar/beacon (H2S) stuff. Wiki gives Gunston and Gilchrist page 56,57. It was not a Norden though. Last edited by blindpilot on 08 Dec 2018, 06:18, edited 1 time in total. Those Lincolns that were equipped with SABS, including those of 9 and 44 Squadron, continued use in the post-war era. These exited service along with those bombers, with their replacement by the English Electric Canberra and other types. These were fitted with the Mk. XIV instead of the SABS, if they had an optical sight at all. So it seems that the Canberra bombsight (those that had one) was indeed the Mk. XIV and likely an updated version of it such as the T-2 or T-4. States that the Mk. XIV was used on the V-Bomber force (Vickers Valiant, Handley Page Victor and Avro Vulcan) and so if these bombers which were more recent and modern than the EE Canberra used the Mk. XIV bombsight (or an updated version of it) then the chances that the Canberra also used the Mk. 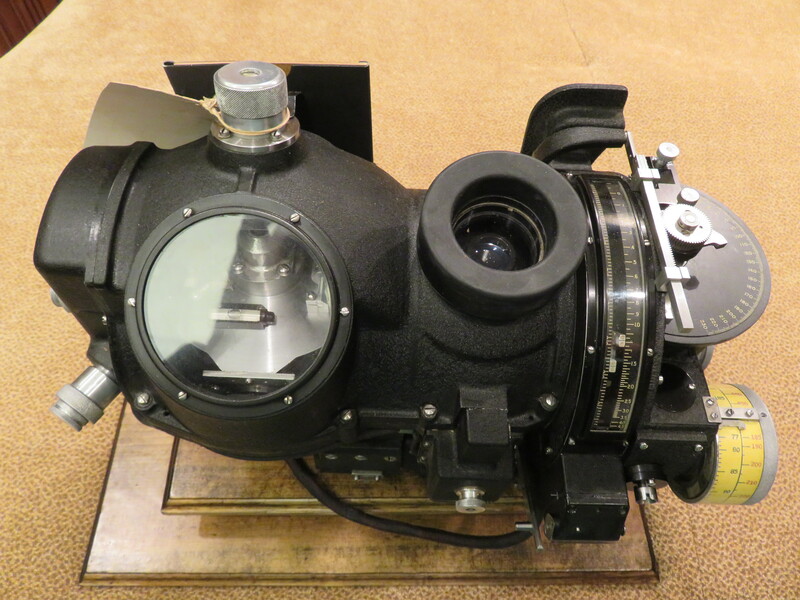 XIV bombsight (and in face with what was stated above) would be IMO, huge. At the same time, I'm aware that the Canberras used by the USAF were American built versions - the B-57 Canberra - which could have different equipment, potentially including different bombsights but in the sequence of what was already said by others above, this is unlikely.